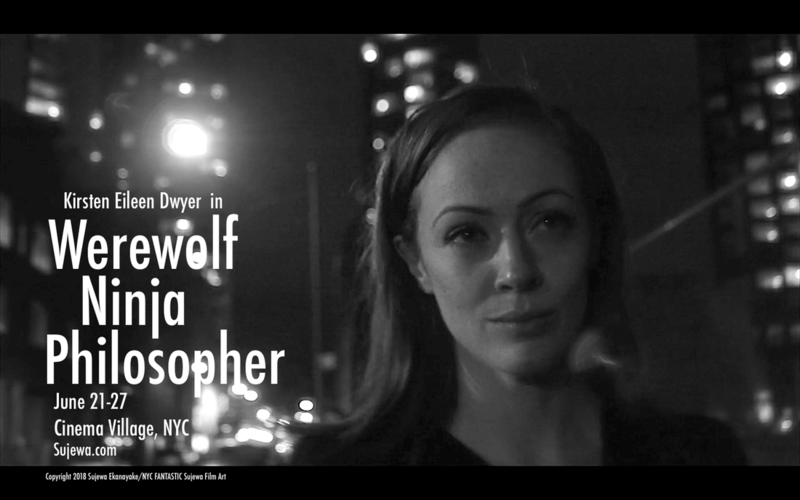 In WEREWOLF NINJA PHILOSOPHER someone is killing art filmmakers in NYC. The City calls on Werewolf Ninja Philosopher - a werewolf who is a ninja, a philosopher, and a private detective - to help stop the killings. A deadpan, slow cinema, minimalist, black & white, NYC art/indie/DIY/underground werewolf noir comedy by Sujewa Ekanayake. Starring Art Shrian Tiwari as Werewolf. Also featuring Kirsten Dwyer, Alia Lorae, Rachel Dixon and others. Music by Kevin MacLoed (full music details coming soon). Copyright 2018 Sujewa Ekanayake. "Pardon me for being hysterically positive about Sujewa Ekanayake's latest indie comedy creation, Werewolf Ninja Philosopher, but when a no-budget flick like this shows up with everything in place – great casting, great B&W images, clever scriptwriting, perfect music, gutsy editing and scene-building, both meaningful and funny too – it's time to cheer for the entire (thought-of-as-dead) real indie scene."